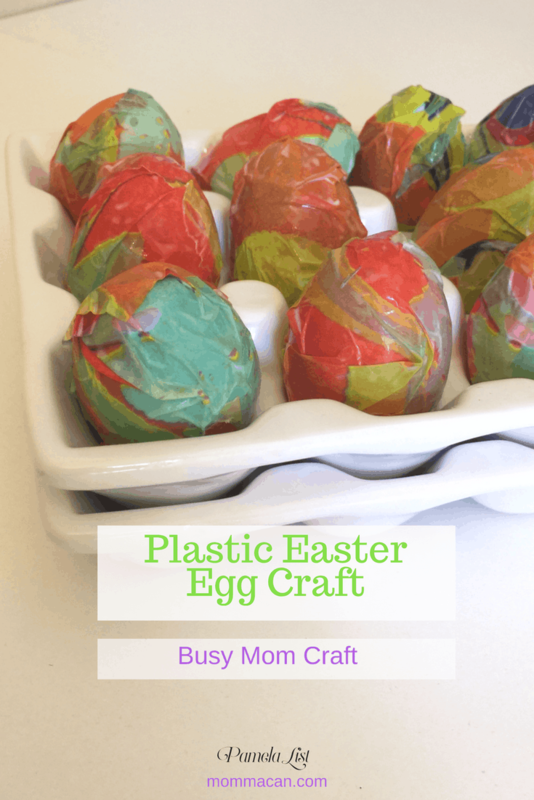 If you have young children and celebrate Easter, you are going to love this simple Plastic Easter Egg Craft using tissue paper and Elmer’s glue . Plastic Easter eggs are abundant in many homes during Easter time. They are inexpensive and usually filled with candies, stickers, or some other small fun element. There have been many Easters when I have more than two dozen just sitting around the house taking up space. 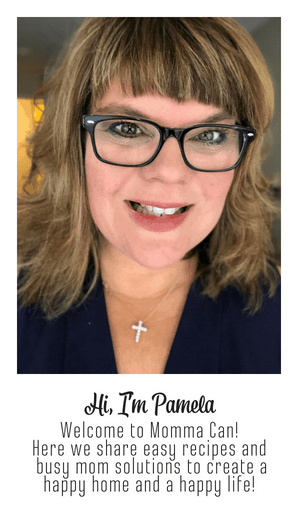 So, I thought why not make a simple craft with items around the house as a part of our Busy Moms Crafting series! I bet you probably have all the things you need at home to make this project! Scissors for an adult to cut strips and squares to cover eggs. 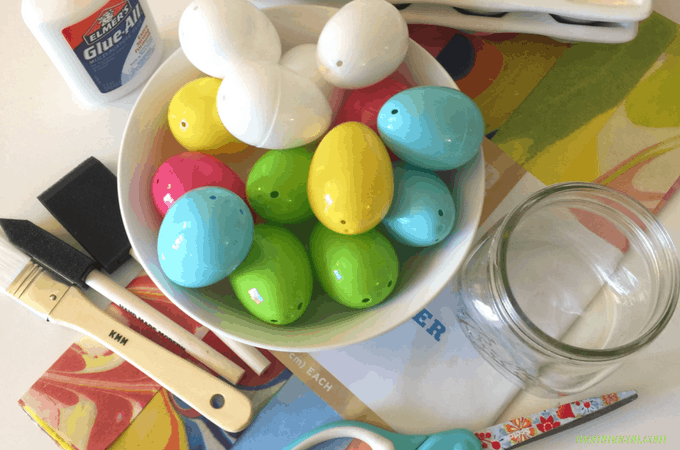 Glass bowl or mason jar to mix glue and water to create magical Easter Egg Paste! I used a wide mouthed mason jar. Foam Sponge Paint Brushes or whatever you have on hand. Tissue Paper – Cut into 5in x 5in squares and several of these cut into 1-inch strips to cover blank spots. Egg Tray for Drying – I used this one, but you can use the carton your eggs come in taking care when to turn the eggs while they are drying to prevent sticking. I found my tissue paper at Target in a spring section near the cards and gift wrap, but the link above goes to a funky polka dot that I totally love and am using in another craft this month. Gather supplies and cut tissue paper into squares and strips. ( It might be a good idea to cover the table with a disposable tablecloth or large plastic trash bag. Mix 2 parts Elmer’s Glue to 1 part water. Start with half the water and work your way up. You do not want a super runny consistency but a nice smooth easy to paint mixture, remember the more water you use, the longer it will take to dry, and the tissue paper will be super messy if it is too wet. Now the children can help. Paint each piece of square tissue paper with the glue mixture: front and back. Then wrapped the egg with the square taking care to have the most colorful side of the tissue paper showing. 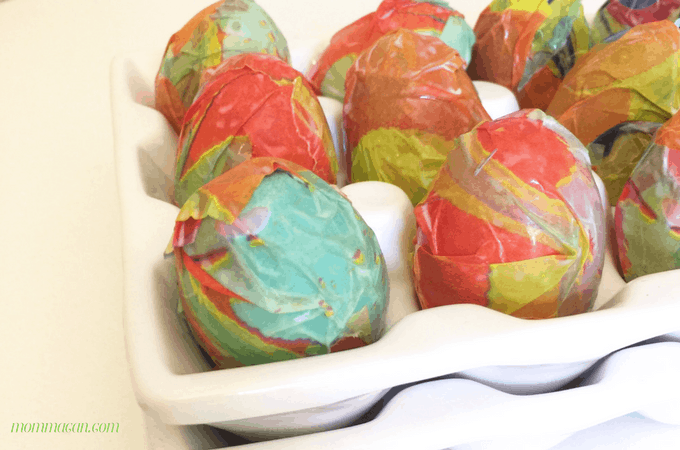 It is easier to work the paper with your hands to get it snug around the eggs. It is sticky, so be prepared. 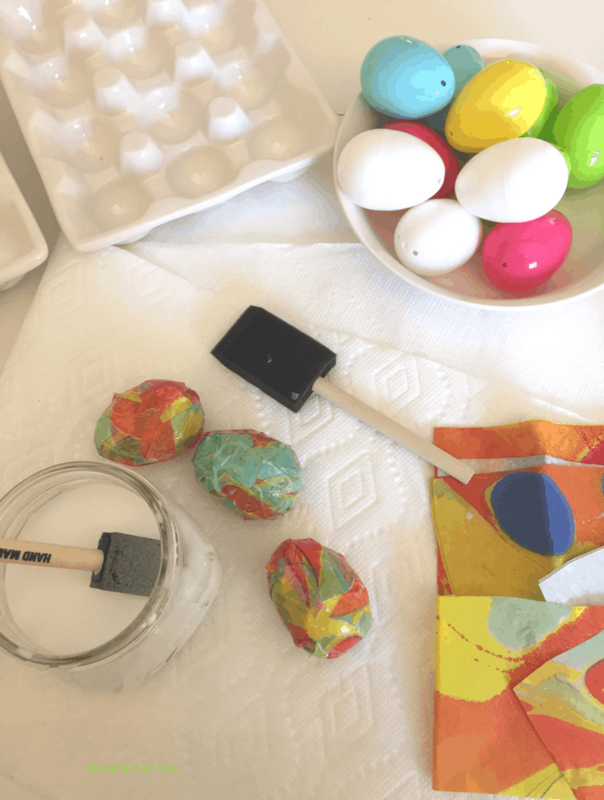 If there are any plastic spots still showing use the tissue strips paint with the mixture and cover the holes, smoothing as you adhere it to the egg. Place eggs in the tray to dry and after a half hour turn the eggs over so they do not stick to the tray. 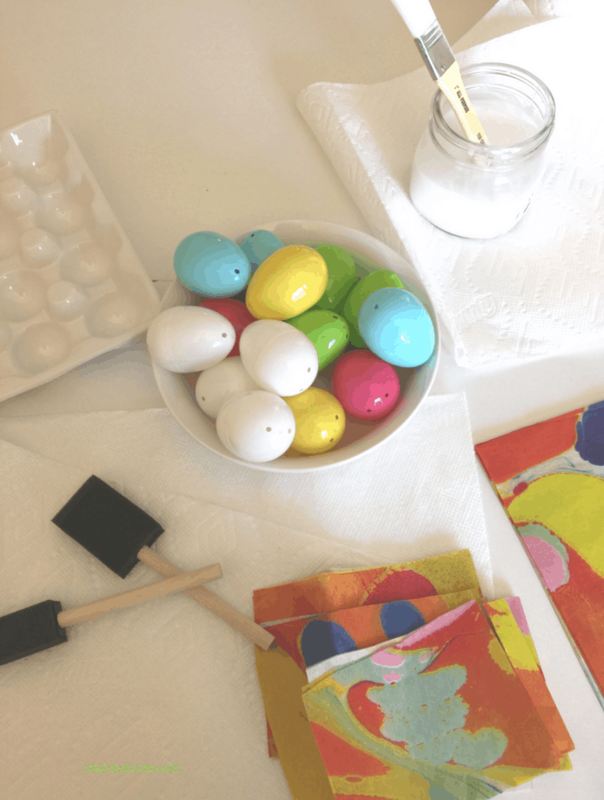 Tips for a successful Easter egg decorating craft. Enjoy this simple craft and make sure to give lots of praise even if you kiddos only help for a short period. They will remember this moment, and you will have pretty eggs to show off in your Easter decor! This looks like a fun project for big kids and little ones. It really is a great Easter Craft. This looks so fun! Pinned! This is a great simple project for little hands. Also with the plastic eggs you don’t end up having to use up two dozen boiled eggs that no one really wants.